Navagio beach in Zakynthos island is one of the best beaches in Greece, and one of the most spectacular-looking beach in the world. It will undoubtedly be one of the highlights of your trip. The day-cruise boats that take bathers to the beach have a bar and serve lunch, but you might want to pack your own picnic for the day. Make sure you get enough water, and don’t forget your parasol and snorkeling gear. Water Sports: There are no water sport opportunities on the beach. This does not stop some people who arrived in expensive yachts from fouling the atmosphere with jet ski noise. Snorkeling: Navagio beach is a good snorkeling site. 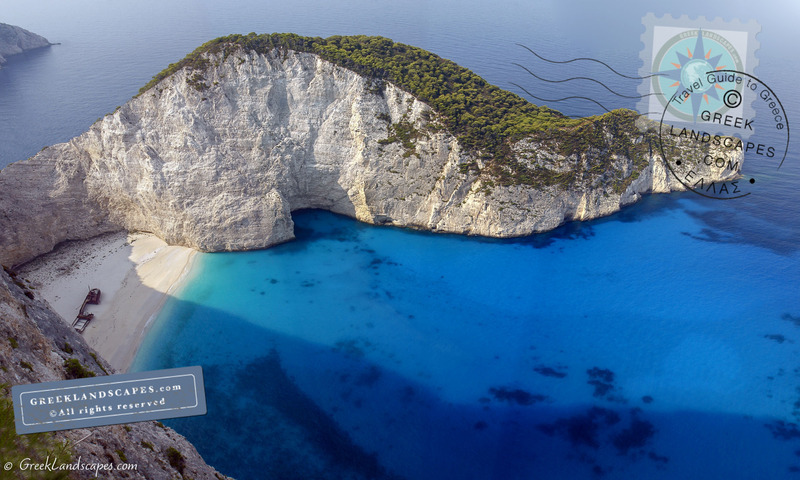 Even if you haven’t been to Greece, you have undoubtedly seen the posters of Shipwreck beach somewhere, and just from the photographs, you probably thought “I’d love to be there someday”. Those who have been there would testify that it’s just as beautiful as the photographs, and even better. They undoubtedly think that they would love to go back. A photograph can barely approximate the visual harmony of the landscape; it’s only a facsimile of the real sunlight that bathes everything, and it doesn’t even get close to transmitting the sensation of sun rays on the skin, the cool breeze, and the play of hues between turquoise and azure. You would be hard pressed to find anyone who would argue that Navagio beach is not one of the best beaches of Greece. That’s because it is that spectacular of a place. The water is perfectly cool, the coarse sand warm and inviting, and the cliffs engulf you in a perfectly proportioned warm embrace. But the subtle beauty of Shipwreck beach is how it transcends our own human time into grander geological proportions in a very succinct and clear manner. The limestone cliffs erode to transform into an inviting white beach, and the decaying shipwreck is there to make the whole process visible. Mentally, the isolation and the shipwreck emanate feelings of adventure and romance. It has this “deserted island adventure” sort of feeling, in a safe kind of way. The shipwreck is an old coaster named “Panagiotis”. Legend has it that it was a smuggling ship that capsized on the beach in 1980 while unloading its cargo of contraband cigarettes – apparently a regular activity on the isolated beach -, or while being pursued by the Hellenic Coast Guard depending on the story you read. That’s how the beach has acquired the nickname “smugglers cove”. Today, the shipwreck’s badly corroded shell is embedded firmly in the center of the beach and it’s a popular tourist attraction. It’s so perfectly placed at the center of the beach that there is a rumor that the Hellenic Ministry of Culture (overseeing tourism) planted it there. Knowing a thing or two about Greek government, I think whoever came up with this rumor grossly overestimated the ingenuity of Greek government officials, especially the ones who man the Ministry of Culture top offices. Besides, planting a boat in the middle of a beach is not exactly a quiet, simple, or cheap operation to go unnoticed, and no Greek politician or reporter would be able to resist boasting about conceiving such a plan for more than three seconds. The ship has been there for a few decades now, and the iron haul will continue to biodegrade as part of the natural recycling process. It will probably be visible for a few more decades above the sand so many more visitors will get to enjoy it. Don’t let the beauty of the beach and the surrounding landscape seduce you to the point where you let your guard down. Navagio beach and the surrounding landscape can be a treacherous place to venture if you don’t pay attention. 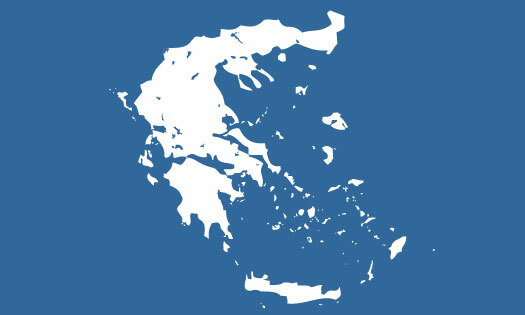 Read more about general safety in Greek beaches. Despite numerous signs next to the wreck that warn of danger, bathers regularly approach and explore the wreck. There is a large opening on it’s port side now and one can easily walk right in. Climbing around the wreck is not advised though because the steel plates have been weathered down to paper thin size in places by now, and many spots can’t support much weight. The beach is surrounded on three sides by tall, vertical cliffs. They offer tempting views for spectacular selfies, so many visitors venture a bit too close for their own safety. The cliff edges are soft, and might not provide the secure foothold to keep you upright if you step too close to the edge. There have been instances of unfortunate souls plunging to their demise. At this writing, there have been two fatalities as recent as 2017. The soft limestone cliffs are prone to frequent landslides, so unfold your towel more toward the center of the beach. As recent as 2018, a huge slab of the cliff slid down toward the fully packed beach. Luckily at that time, the damage was only few light injuries and a few overturned boats. Despite the large number of visitors daily, the beach has no lifeguard. Drownings are not frequent, but not unknown at Navagio beach. If you are not a strong swimmer, be extra careful when you are in the water, and pay particular attention to the large number of boats that meander through the large number of swimmers. There is no way to get to Navagio beach on foot. There is a lesser known goat path that leads to the top of the cliff behind the beach, but there is no way to get to the sand from there. The task of building a road or steps to the beach does not seem prohibitive, but absence of easy access supports an entire industry of day-cruises that’s very lucrative and provides work for many people around the island. Better yet, it keeps all development away and the beach as pure as possible. 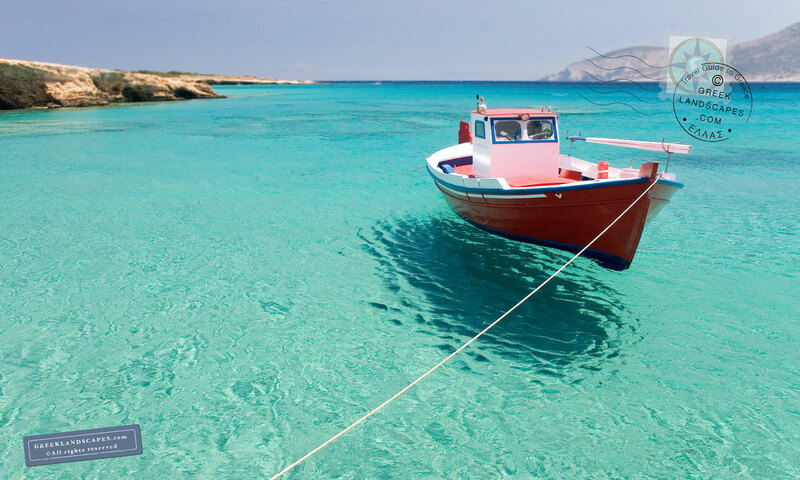 You can reach the beach by boat from Zakynthos town, or from Alykes where you can book a day-cruise. The cruises include a larger tour around the island, the highlight of which is a one-hour stop at Shipwreck beach. These boats are large and comfortable, although they do get packed with passengers, so your space would be limited. Get to the boat early and find a good place for your company to sit, knowing that most of the land will be to port-side pretty much the entire trip. Another option that’s highly recommended, is to drive to Cape Skinari, at the very top of the island. There is a nice lighthouse and and a restaurant there, and you can hire a smaller boat to sail to the Blue Caves and to the Shipwreck beach. There are two advantages to choosing a boat at Cape Skinari instead of the larger cruise boats from Zakynthos town or Alykes. First, you have a short five-minute ride to the blue caves that are just around the corner, and a much shorter ride to Navagio beach (about half the distance from Alykes, and 1/5 the distance from Zakynthos town, so you minimize your time on board. Also, their smaller boats can fit right into the caves and sail closer to the shore. If you go that route, remember to bring your own water and food for the day because at cape Skinari your options will be limited to what’s available at the lone restaurant (if it’s open). If you have your own boat (or if you rent a boat), you’ll have the beach to yourself before the boats arrive around 10:00 am. At this time most of the beach is still in shade and the sun rays don’t cover the whole area until about noon.